Mobile Motor Factors - a car parts and engine parts delivery company located in Athlone and servicing the wider Midlands region - is celebrating five years in business. The business is a remarkable success story. 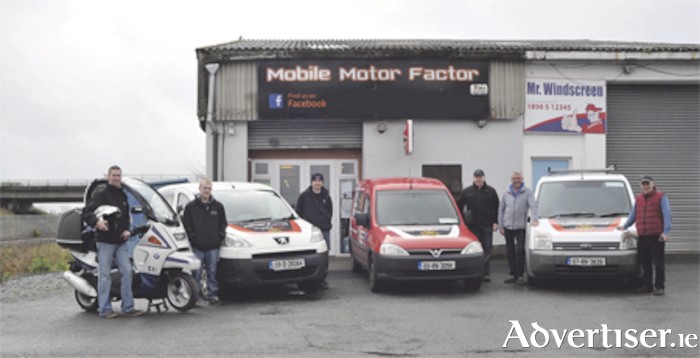 Established back in 2013, Mobile Motor Factors began with a single delivery van on the road and a garden shed as a base, supplying car parts to mechanics and garages in the evenings and at weekends. Since its humble beginnings the business has grown dramatically. Three years ago the business expanded by taking up residence in a two-storey premises on the Roscommon Road. Today, multiple vans and a scooter are on the road seven days a week, 365 days a year. Added to this, Mobile Motor Factors operates an after hours call out service, meaning they are forever at your beck and call should you need them. Mobile Motor Factors supply and deliver high quality car and engine parts for all makes and models of vehicles to your home, place of work, or a location that is convenient for you the customer. Mobile Motor Factors offers a wide range of car and engine parts at more than reasonable prices. The business stocks all common car spare parts for all makes of cars and light commercial vehicles. Some of the car parts that Mobile Motor Factors stock include: batteries, clutches, sensors, drive shafts, starters, engine components, timing belts, shocks, coil springs, steering racks, ball joints, bearings, exhausts, fly wheels, body kits, brake pads, and spark plugs. Mobile Motor Factors Athlone prides itself on excellent customer service to the motor industry. The six members of staff on site are knowledgeable regarding all the car care products in stock. Some of the car care products on offer instore include: oils, lubricants, filters, all grades of antifreeze, and more. Mobile Motor Factors also stocks an extensive range of car accessories including tow bars, trailer boards, number plates, wheel trims, wipers, and window regulators. The business is open seven days a week. For all your automotive car and engine part needs contact Declan, Sean, or Robert of Mobile Motor Factors on (090 ) 6492658/(090 ) 6493542. Alternatively, email [email protected]. To avail of the after hours callout service phone (085 ) 7583555. Visit the business’s Facebook page with any queries or to see a large selection of automotive products on offer. Seat to launch new car every six months!